A First Course in Computational Physics, Second Edition, by Paul L. DeVries and Javier E. Hasbun, was recently reviewed in the IEEE Computer Society bi-monthly magazine, Computing in Science & Engineering. 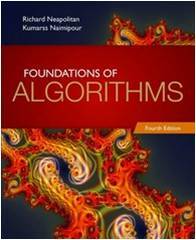 Written in an incredibly accessible format, Foundations of Algorithms, Fourth Edition offers a well-balanced presentation of algorithm design, complexity analysis of algorithms, and computational complexity, with numerous examples throughout. This volume is accessible to mainstream computer science students who have a background in college algebra and discrete structures. To support their approach, the authors present mathematical concepts using standard English and a simpler notation than is found in most texts. A review of essential mathematical concepts is presented in three appendices. The authors also reinforce the explanations with numerous concrete examples to help students grasp theoretical concepts. To help students better understand complex algorithms, the authors use C++ and Java pseudocode, as students are familiar with these languages from their intro programming and data structures courses. Furthermore, students are not required to have a calculus background. College algebra and discrete structures are the prerequisites for the text. The authors, both professors at Northeastern Illinois University, have included a chapter on numerical algorithms with a review of basic number theory, Euclid's Algorithm for finding the greatest common divisor, a review of modular arithmetic, an algorithm for solving modular linear equations, an algorithm for computing modular powers, and the new polynomial-time algorithm for determining whether a number is prime. Databases Illuminated, Second Edition integrates database theory with a practical approach to database design and implementation. This text is specifically designed for the modern database student, who will be expected to know both theory and applied design and implementation as professionals in the field. This Second Edition has been revised and updated to incorporate information about the new releases of Access 2010, Oracle 11g and Intersystems Cache. It includes material on the most recent topics such as, Web access, JDBC, web programming, XML, data mining, and other emerging database technologies and applications. Covers the new features of the current versions of popular database management systems, including Oracle 11, Access 2010, and InterSystems Cache. Incorporates the new curriculum recommendations in ACM Computer Science Curriculum 2008 and ACM/AIS IS2010 Curriculum Guidelines for IS2010.2, Data and Information Management, including more attention to security, concurrency, and net-centric computing. The chapter on computer ethics has been updated to take into account new regulations and practices. Contains more material on recent and relevant topics, such as Web access, JDBC, web programming, XML, data warehousing, data mining, and other emerging database technologies and applications. Includes the extensive object-relational features of the current release of Oracle, with downloadable code for students to implement. Object-oriented databases are implemented using InterSystems Cache, with downloadable code included on the website.